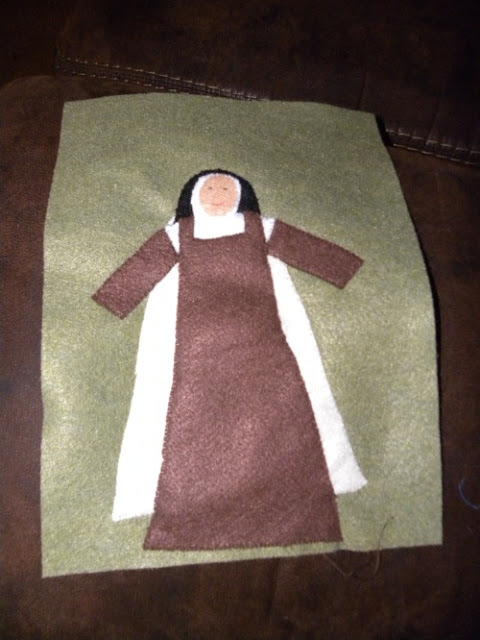 Sadie carefully watched me sewing during Mae's nap time and while this doll was still being cut out she asked: "Is that Saint Therese of the Child Jesus?" I was a little surprised at the name, but she quickly went back to talking about "Marie Therese like they were old friends." But she had guessed what I was making. There just aren't many surprises in this house. This picture doesn't do the doll justice at all, because the stitch that I used for all of the seams is really neat... but it's very late and I'm a little bit too sleepy to do a photo shoot with a doll... so this picture will have to do for now. 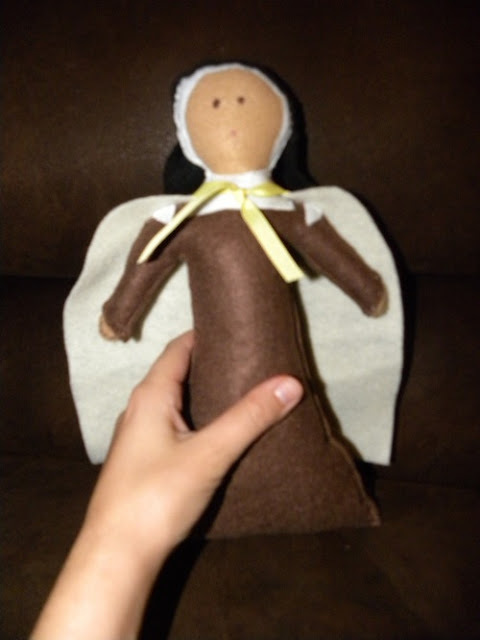 I'm experimenting with saint doll ideas at the moment. I think I'll try to hide this away for a while. Maybe if she forgets about it, it can be a surprise later. This is another little part of a project I've been working on. It's far from finished, but Sadie loves carrying it around the house. I made this one entirely by hand, but having discovered the stitch that I used on the doll I think this project is going to be coming along much more quickly. Now to get a little bit of sleep before the girls wake up. I can hardly keep my eyes open!